(note, this may well have been titled “A Declaration of Love For the Printed Book”). I know, I know, I’m late to the digital party. But I’m just going to put this out there: I’m not a fan of eBooks. I don’t own an electronic reading tablet. Where this aversion came from, I don’t know; it could have been engrained somehow in my analogue DNA at conception. I’m not a technophobe by any means; I have a fairly serious relationship with my iPhone and am regularly called upon to (try to) solve random computer issues. And I had no issue with the move to digital music; it made perfect sense to me in ways eBooks still don’t. In my humble opinion, nothing beats the printed book. Perhaps having worked for a printer straight out of university has helped shape this preference. I was a fresh sheet, ready to absorb the intricacies of gloss lam vs. matt lam finishes and the complexities of printing on foil. I can quite honestly say that there is little as thrilling as a book fresh off the binding line (not hot off the press as then it would simply be stacks of printed sheets that make no sense until trimmed and processed through the binder). It was always an exciting day at Hachette Towers when advance copies of the latest book arrived. All us production nerds (whether we’d worked on the book or not) would gather round, run our fingers over the cover, revelling in the mixed sensations of different cover finishes that delighted our fingertips and relishing the weight of the book in our hands. We’d inhale that new book smell that arose temptingly the instant the cardboard box was opened and as we checked each page. To this day, the first thing I do upon picking up a book is examine the cover finish and read the imprint page. Those bestseller tables in Waterstones are a lethal time-waster for purely aesthetic reasons. (For more on the variety of cover finishes, Picador have done a great blog). Having said all that, eBooks are steadily growing on me, though I will admit to being reluctantly pushed (not quite kicking and screaming) into this digital world. But what a world it is. Not even Amazon Prime next day guaranteed deliveries and even deliveries on a Sunday, can compete with the sheer convenience of eBooks that could quite easily become addictive (as well as severely detrimental to my poor, beleaguered bank account). 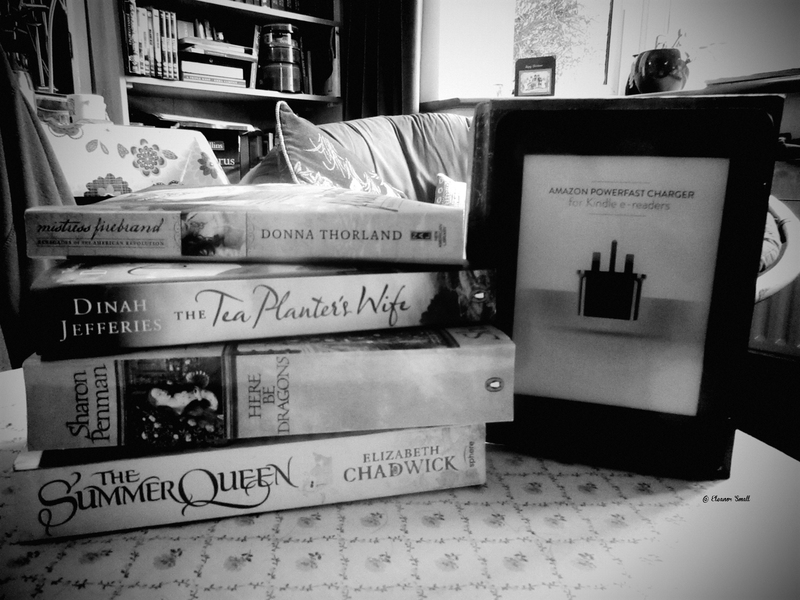 In the three months I’ve spent exploring this new realm I’ve discovered some wonderful authors who issue only digital books, both self-published and traditional. This has ensured hours spent glued to a digital screen as I move seamlessly from one book to the next, instantly devouring backlists. But however instantaneous and convenient eBooks are, particularly with suitcase weight allowance considerations when going on holiday, I still infinitely prefer the printed book. eBooks have no visual senses to delight when they’re tucked away, electronically filed on a tablet, easy to forget that you even own them. I love my bookcases. I have three, plus several stacks and numerous boxes, overflowing with wordy delights; visually pleasing and comforting for the lived-in feel they create, constantly tempting me to read (or re-read). Yes, I most definitely have severe storage issues. But would this ever persuade me to make a permanent switch to digital? Not a chance. And maybe that’s what my aversion to eBooks comes down to: aesthetics. In this arena, no eBook could ever compete. Once the novelty of receiving our very first ever eBook in the Production Department wore off, it was hard to get excited over a new one’s arrival. There was no communal oooing and aahing; after all, I don’t think anyone these days finds receiving a PDF via email thrilling. There were no visual or tactile senses to be delighted and, in this magnolia world, the texture, weight and colours of a book, fabric or wallpaper can make or break.